Ashland Oregon – where culture, nature, and adventure travel come together. And now is the time for some amazing quick rafting trips starting right from downtown! Ashland is a northwest cultural center surrounded by a playground of natural wonders. It is home to the Oregon Shakespeare Festival, tons of wineries, unique hotels, amazing restaurants, hiking, biking and trail running, and Momentum River Expeditions. We are proud to be located here, with some of the world’s most spectacular whitewater rafting right in our own backyard. You will enjoy world-class river trips in small groups with unparalleled personal service, a handcrafted quality and attention to detail, organic meals, and one of the most experienced (and friendly) guide staff’s in the world. Whether you’re a first-timer or an experienced paddler, join us for an Ashland river trip that is like no other! Visit our About Us and Why Momentum pages to learn more. 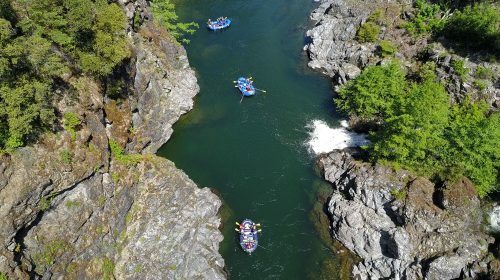 Below is more information on our half day and day trips leaving from Ashland, Oregon, or you can explore all of our river trips our interactive rivers map. 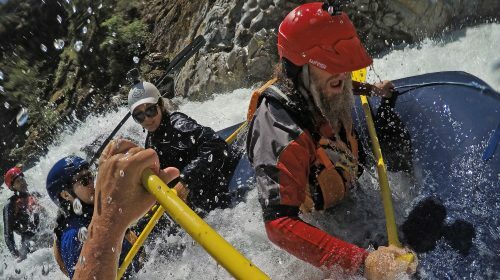 Named as one of “Ten Once-in-a-Lifetime Cascadian Journeys” by Portland Monthly – Combine rafting big summer flows down rapids over a football field long, an ultra-comfortable ‘safari style’ backcountry camp (think glamping), and options for mountain biking, running, inflatable kayaking, and fly fishing – there is no trip like it in the U.S.